2. The storage space in my closet is nearly maxed out. I look for the straight edge from the manufacturer and place the two straight edges together. Using hand quilting thread (that matches your batting), make large whip stitches and join the batting. (I used contrasting thread here to show the detail.) It takes a bit to get the right tension to join the seam without buckling. You want the batting to be joined without any gaps, but you don't want to pull too tightly to cause a ridge where the seam is. Whip stitch the length of your seam, and knot at the end. That's it. For this baby size (about 46" long) it only took me about 30 minutes, which I didn't think was bad at all. But of course, I don't mind hand stitching. I have also heard that you can use your sewing machine set on a zig zag stitch to join the batting, but I have never tried it, as my JUKI doesn't have a zig zag stitch function. I want a new bed quilt. But I can't decide what colors to use. A few weeks ago I was going to use this stack. And make a candy bar road quilt. Then I got nervous about my color combination. But a few days ago it came to me. Use my lovely Denyse Schmidt fabrics. To make a bento box quilt. Now I had better cut into this fabric. here is my newest work in progress- a baby quilt. it's small. only 36" x 44" or so. but i love it so far. i'm really, really happy that i was brave enough to add the one orange square. and i like that the squares go right to the edges of the quilt. do you print your digital photos? where? i would like to have some of my photos printed to hang on my walls. where can i get a decent quality photo when it is printed to 8" x 10" or possibly 11" x 14" without costing me an arm and a leg? i'm using about 71% of my storage space on blogger and i'm starting to panic. what do i do when i run out of space? (maybe it's a sign that i need to quit blogging? by the way, what is the life expectancy of a blog anyway?) i'd really like to keep my blog all in one place....does anyone have any suggestions on what to do? has anyone else had this problem? A few weeks ago I was contacted by Moda Lissa (isn't that the BEST blog name ever?) about being a contributor to the Moda Bake Shop blog. Would I be interested? My first project, as you can see, is a simple baby quilt using charm squares. From start to finish this quilt took me just two days. It's the perfect project for a last minute baby gift. So, go check out the Moda Bake Shop. There are plenty of cute projects designed just for your pre-cut fabrics! I really like using up every last bit, most of you know that. But it's time really consuming. And it requires a lot of organization. I'm getting there, but I have a lot of room to improve. This is my preferred method. At least for now. I take out all the larger pieces and sort them by color. Bonnie has an impressive scrap users system. And I have tried something similar once, but for me, it didn't work. I do a lot of improvisational piecing and I don't like trimming down fabric to certain sizes. I like having random sized scraps. So the color sorting method works for me. The smaller boxes are just cheap plastic shoe box-sized storage bins. Pink and white scraps seem to rule the roost. Then I put aside the strings and not so pretty salvage pieces, to be used for knit rugs. These pieces are perfect sizes for my spiderweb scrap quilt. They are 1"-2" wide, approximately and most are not very long, maybe 6" or less. Then I have the strings that are too wide for the knit rug, but too skinny for the spiderweb quilt. These are set aside for card making. I have a small stack of 2.5" squares. They are nice standard size square to have on hand. I think most of them are leftovers from projects over the years. Now this is where it gets ridiculous. Snippets. These are less than 2.5" square. I think most are 1" x 2" or so. But I have used these. So I continue to save them. Then I have scraps in bags. These are a mixture of things. Some are projects that I wanted to save the scraps for another project...someday. The green scraps I liked too much to put in with the other greens, so I bagged them. 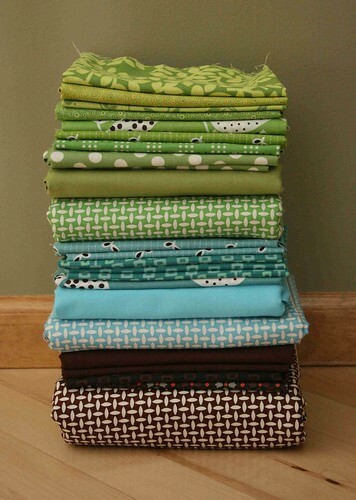 Then I have my red and green bag-scraps for a Christmas quilt...someday. If I would recommend one thing, I would say, DON'T START storing fabric in plastic bags. It's dangerous. And...I think they multiply in the back of a dark closet. And this is my blue + purple bin. And misc. fabrics. I really need to sort through this monster. Now, how do YOU sort your scraps? Last summer my friend Darcy and I started working on a quilt for her. She sorted through my scrap bins and then we added a healthy dose of white fabric, which is always a winning combination in my mind. We made up the pattern as we went along. I'm not sure this is the best method to teach for a first quilt, but we are both thrilled with the results. We were aiming for a largish lap size and the quilt ended up being large enough to fit a twin size bed. Perfect! I love that it can be used as either a bed quilt or a throw. But even better than that, I LOVE that we made it two sided. When we were piecing the back, the one requirement was to piece something completely from my stash. This is what we came up with. This color combination is one of my current favorites. 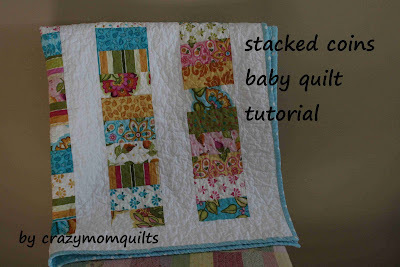 I basted it, quilted it and added the scrappy binding. Darcy is now 9 months pregnant with her first baby. She has been put on bed rest, so yesterday I delivered the quilt to her. It was fun to surprise her with her finished and oh-so-cheery quilt. Things are wrapping up for the Virtual Quilting Bee. Somehow we ended up with 3 blocks to make this month. This one is for Sarah. She wanted texture. It was a fun challenge. I am pleased with how it turned out. The fabrics were wonderful to work with. This is for Grace. We did monochromatic random piecing for her, which is right up my alley. I love this one. It was nice to use up some of my little white scraps, too. I made all these today. And I am tired. If I can muster up any energy after bedtime tonight, I hope to make a few blocks for this. And lastly, this is what happens when my husband gets involved in making a Valentine's box for my son. Isn't it fabulous??? I made the name label and did most of the painting, otherwise it was all him. He's a handy man. (I sure love him!) It was a big hit with my son--and all of his class, too. You guys!!! You are so sweet. Thanks for all your comments!!! I am blown. away. It took me awhile to read through all the comments to see what you were up to the past few days. :0) I feel like i got to know you all better. That was fun...let's do it again sometime. The winner of the fabric is...number 5, Regi. Thanks to all of you who played along! Despite my sick kids, (we've had strep, fever, flu [ewww!] and a cold going around) I finally finished my swell quilt top. I debated a long time about the layout. I wasn't feeling the zig zag...so on Sunday night I played around with about 4 different layouts and this was my favorite. I love the vintage feel of it. I still want to do a zig zag quilt sometime, but in my mind, this wasn't the right fabric combination for it. I used 4 swell charm packs (32 squares in each) and i paired the squares with cream fabric (quilter's only cotton in the color parchment-from JoAnn's) and made them into triangles. Triangles are not my favorite, but I think it will be worth it. The layout is 14 by 18 blocks. It measures about 56" x 72", which means I will have one more to add to my lap quilt collection. But in my defense, I did have this one started before the beginning of this year. I already have the backing (and binding) in my stash, so I'm hoping to finish this quilt soon. My name is AmandaJean and I live in Wisconsin. Today I am doing laundry and I am working on my Swell quilt. I am making chicken wild rice for dinner in my crock pot so I have more time to sew! In your comment, please make sure there is a way for me to contact you in the event that I draw your name. Thanks! My daughter's little friend turned 2 a few weeks ago and tomorrow is the birthday party. I'm sewing matching outfits for my daughter and her friend. I've found that props help a ton. See the little shorts peeking out beneath? I opted for those rather than bloomers. The shorts pattern is Butterick B4966, in size one. The dress pattern is my own, enlarged just a little bit. So even though summer is still a long way off, we'll be ready (and waiting) for it to arrive. At long last, I own a pair of hand knit socks. They are even better than I had imagined. They feel sooooooooooo good on my feet! I swapped these with Mama Urchin in exchange for quilting. About a week and a half ago, I was contacted by someone who wanted to buy some doll quilts and pillows. I have toyed with the idea of opening an on-line shop more than I care to admit. But in the end, I always freak out. I don't want to run a business, I want to spend that time quilting. All the details of the business side of things would drive me crazy. (Not to mention the CPSIA fiasco.) So, we ended up setting up a swap instead. I think bartering is way underrated. I now have a pretty pile of fabric (my first jelly roll and layer cake!!!) and some of the doll quilts and pillows I made have a new home and have made one mama and her girl very happy. The fabric can be found here. This has to be the very best kind of cake. The whirlygiggle quilt is complete! It was a joint project between Heather and I. It is going to be donated to our sons' school silent auction, which is this Saturday. Planning a donation quilt is tricky. It's hard to guess what color scheme that will appeal to many people. In this case, we didn't want it to be gender specific or too kiddish either. And we wanted to work completely from our stashes. I really like the outcome of this quilt. It is a twin size, so if someone buys it, (do you like my confidence?) it can be used on their child's bed. Or as a lap quilt. We each pieced blocks for the top. Heather pieced the back, basted it and stippled it. 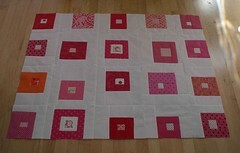 ...which is pieced from scraps. And here it is, on my son's bed. I just need to attach the label. Now this doll quilt, I love. It measures 14.5" x 18.5". Quilting inspired by My Aunt June. I love being able to start and finish a quilt all in one day. And using up scraps-even better.